Umbrella strollers are so convenient and, when you have 2 kids, convenience is the only way to go. To help you find the best double umbrella strollers for your kiddos, we’re done the research so you don’t have to. Because, if you have 2 kids, you probably don’t have time to anyway. We put together reviews of the top 10 products below. Before we get going, let’s look at some of the key features you need to know. Age Range: Age range can be tricky because most of these are based on weight. That said, one thing to remember is to only put a newborn in an umbrella stroller meant for a newborn. Why? They need a little more support. Weight Supported: This is the total weight the stroller can handle. Keep in mind that each seat will be able to support half of the total weight. The more weight it can hold, the longer you can use it. Reclines: All of these have independent reclining seats, and thank goodness. If one kid wants to nap and the other wants to sit up and look around, being able to accommodate both is the only way to enjoy a peaceful walk. Tray: These umbrella strollers don’t have trays. It’s just not something common in this type of stroller. That might seem like a bummer, but here’s why: they wouldn’t be as lightweight or compact if they had one. Product Weight: This is so important. Part of the reason umbrella strollers are so great is because they’re so compact and easy to transport. An umbrella stroller should be light enough that you can lift it by yourself without a problem. Dimensions: If you’re looking for a stroller that’s easy to stow in the back of your car, pay special attention to the dimensions. They don’t always fit easily, especially if you have a compact car with minimal trunk space. If you have two small children, the best lightweight double umbrella stroller can really make your life just a little easier. Now that you know the features to look out for, let’s get to our reviews. If you’re in a hurry, take a look at the top 2 products on our list first. These are our top pick and budget pick. Both are great and will give you an idea of what’s available. All right! Let’s get right into our reviews. 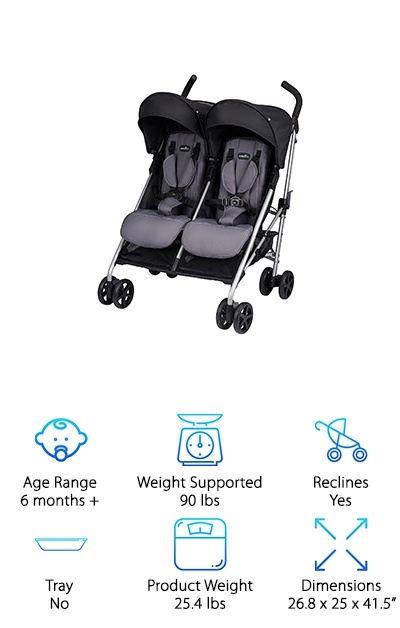 There are a lot of great features on this Maclaren Twin Techno Stroller that help relieve some of the craziness that comes along with having 2 kids. For one, you don’t need to worry about protecting your little ones from the sun thanks to the UPF 50+ sun canopy. And get this: the canopy is also extendable, waterproof, and has a built-in sun visor. The seats recline to 4 different positions and each one has an extendable leg rest. What’s really great about this best reclining umbrella stroller is the newborn safety system. This is so important because little ones who don’t have head control yet need this special support. That’s not all: it comes with a wind-resistant rain cover, too. 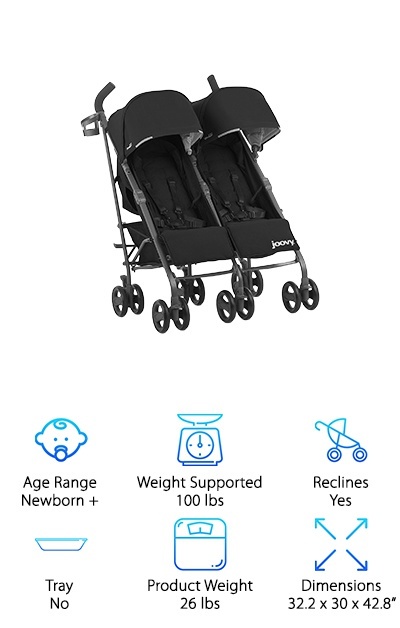 If you want to find the best umbrella double stroller you can and still stick to your budget, check out the Delts LX Tandem. The seats recline independently so each of your little ones is happy. Plus, there’s a large canopy that protects them from sunlight or a little bit of rain. Each seat also has a 5-point safety harness. But wait, there’s more. Like some awesome features that mom and dad will love, too. 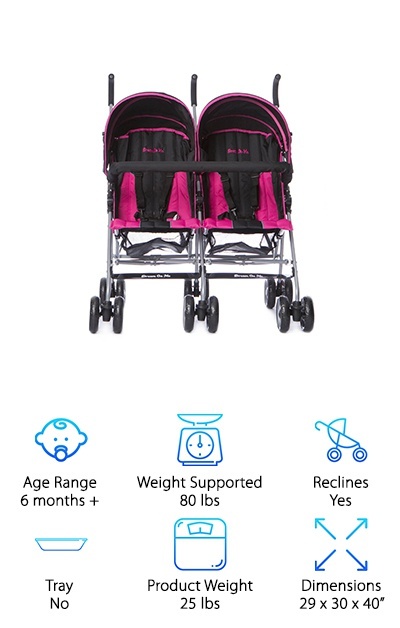 First, this stroller has a really lightweight frame and is really compact when it’s closed. It’s super easy to transport! There are also 2 large hanging storage bags for everything you’ll need to bring along with 2 kids. Plus, there is a parent cup holder. You’ll need it for your iced coffee. This Joovy stroller is the best infant umbrella stroller. Why? 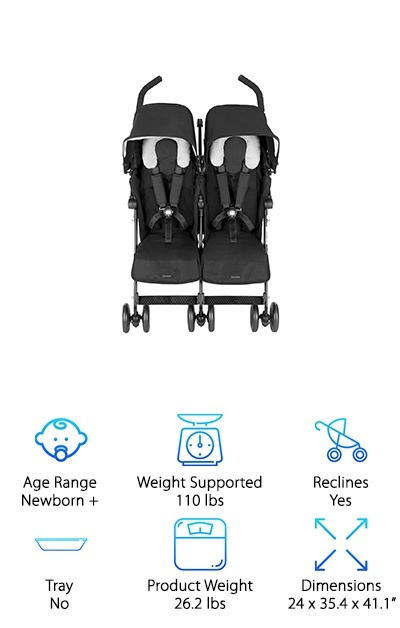 Because it has a bassinet mode, perfect to safely hold even the newest members of your family. But that’s not all. Each seat can hold up to 50 lbs so this one can definitely grow with your kids. The fabric is water resistant and each seat has a canopy with a UPF of 50 for effective sun protection. 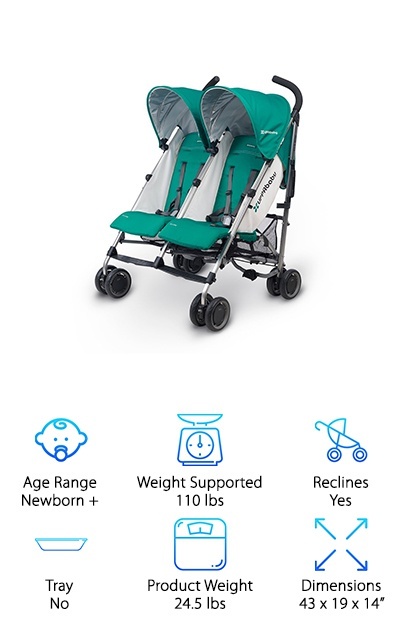 But this stroller isn’t just great during the day, it even has safety reflectors so you can feel comfortable using it at night. And storage? Well, there’s a lot of it. There’s 4 mesh pockets, 2 zippered pockets, and 3 cup holders. It also folds down easily. And get this: it even has a carrying strap. 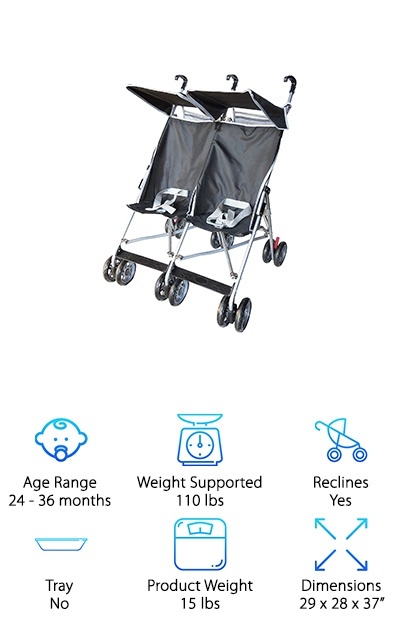 One of the best features of this stroller is that it’s only 27 inches wide. Why is this such a big deal? Because you’ll be able to easily get through any standard doorway. 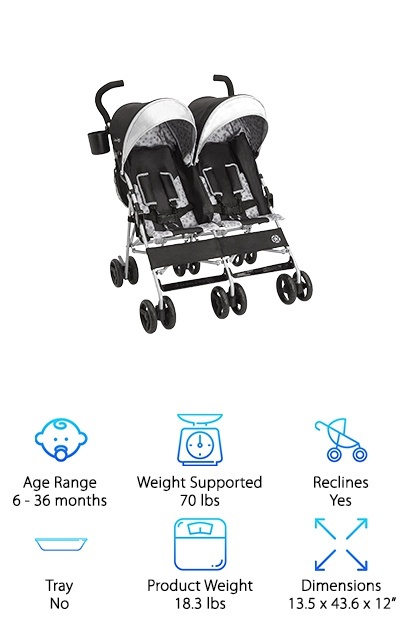 That’s not the only thing parents will love about this stroller. You can fold it up with one hand and it’s self-standing so you’ll be able to tend to your kids without worrying about getting the stroller put away. You also get a cup holder and a generous storage basket so you can take along everything you’ll need. Each seat reclines independently and has a two position footrest so each child can have exactly the set up they want. There’s an oversized canopy to block out the sun, too. 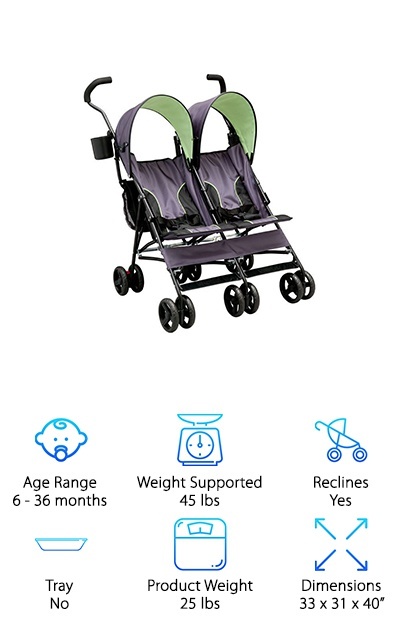 This double umbrella stroller has independent reclining seats so that each child will be comfortable. You can be sure that they will each want something different and it’s great to be able to give it to them! And guess what else? The seat backs have a roll-up cool climate feature. There’s a mesh backing that allows air to flow through on hot days. The expandable canopy is perfect for keeping your little ones out of the sun, too. It even has independent extendable visors and rear hood coverage. This one is really lightweight - only 21 lbs! It also folds up quickly and compactly so it’s easy to store and lift. It has a 3-point harness so any baby who can sit independently will be safe and comfortable in this one. Each seat in the Jeep Scout Double Stroller has a 5-point safety harness with soft shoulder pads so you know your kids will be comfortable. They have reflective material, too, in case you’re walking with them at night. Another feature is the extendable sun visors to protect them from the sunshine. This lightweight stroller fits through standard doorways. You might not understand how convenient this is until you’ve tried to fit a big stroller with 2 kids strapped into it through a door that’s just a little too small! You get a lot of storage with this one, too, in the double rear canopy bags. One more thing: a cup holder for you for when you’re on the go with your littles. A lightweight stroller that can fit through standard doorways, this one from Delta has a lot to offer. For starters, how about 360-degree shock absorbing wheels? There’s a 3-point harness strap to keep your kids safely buckles in, independent reclining seats, and a canopy to shade them in the sun. This one was designed with parents in mind, too. First of all, there’s a lot of storage on here. 2 hanging storage bags let you take along the necessities for your little ones, like extra diapers, sippy cups, and snacks but you’ll still have enough space for your keys or wallet. You also get a cup holder with two attachment points. Best of all, it folds up compactly for easy transport and storage. 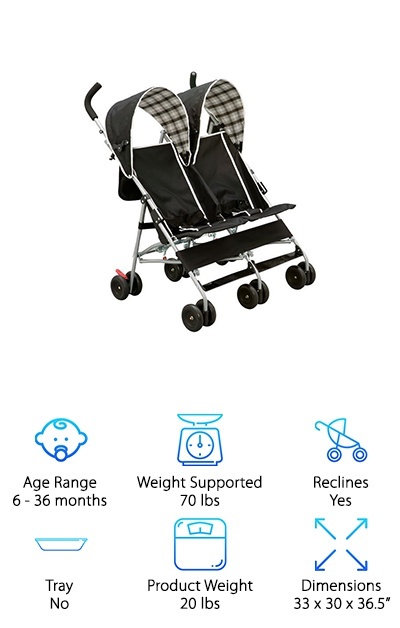 UPPAbaby really designed this stroller with the individual needs of your passengers in mind. Why do we say that? For starters, each seat reclines independently and has an adjustable footrest. So, if one of your littles is ready for a nap, you can lay them back and make them comfortable while their sibling enjoys the ride. The canopies have peek-a-boo windows so you can keep an eye on things while you’re pushing them along. There’s also a canopy with extendable 50 UPF shades to protect them from the sun. It maneuvers really easily, too, because it has only 4 sets of wheels. And here’s the kicker: it has a one-action fold that requires minimal effort on your part. When it’s folded, it even stands on its own. This compact double umbrella stroller really has a lot of awesome features to make both parents and kids happy. For the parents, there’s abundant storage space. Two large baskets give you enough room to hold extra diapers, snacks, bottles, and sippy cups with room left over to tuck in your car keys or wallet. It’s lightweight and easy to fold so it’s no problem to store or lift into the trunk of your car. For the kiddos, well, there’s no need to worry about their comfort. Each seat has a 5-point safety harness to keep them secure while you’re walking along. They each recline independently, too, and have an adjustable canopy. One more thing, and we have to say it: this stroller looks super stylish, too. 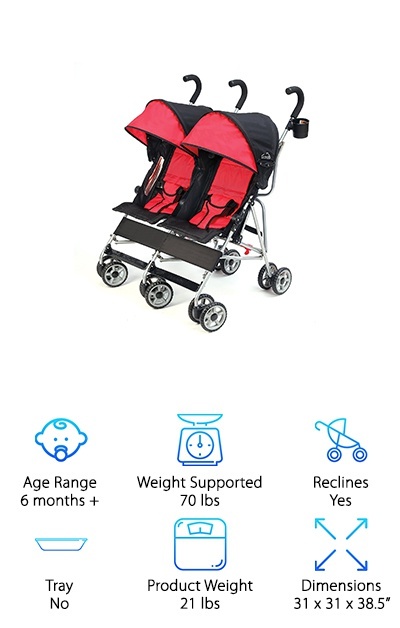 If you’re looking for a basic stroller for your toddlers, Amoroso has a great option for you. For starters, it only weighs 15 lbs and is the lightest one in our reviews. Despite being so lightweight, it’s also durable and flexible. You’ll have no issue getting it into the trunk of your car or carrying it wherever you need to go because it folds compactly. That’s not all. Each seat has a 3-point harness to keep your kids safe and a canopy to protect them from the bright light of the sun. There’s storage for diapers, wipes, snacks, and any of the little things you’ll need when you’re out for a walk with your kids. One more thing: the 360-degree swivel wheels make it easy to maneuver.